This French Art Deco Tea Set was designed by Christian Fjerdingstadt (1891 – 1968) for Christofle. 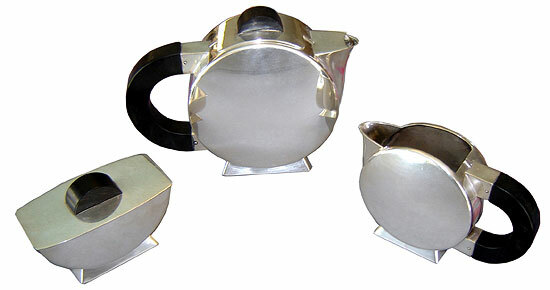 Of silver plate and ebony the set of a tea pot, sugar and creamer was designed in 1933. Similar sets were used on the ocean liner Normandie. The tea pot measures 5-3/4” high.